Referred to as a boutique resort, Laguna Anjuna is an escape into the solitude of Goa. Unique in its concept and design, Laguna Anjuna is a cottage resort cleverly crafted into the existing natural landscape to create a rural ambience with modern comforts. Located some 700 meters from the beach the resort looks out across a wide expanse of paddy fields stretching out to the hills between Anjuna and Baga to the south and the beaches to the west. Externally, Laguna Anjuna is very appealing, built in thick laterite stone with pillars and domes. The accommodation consists of a quaint collection of cottage suites, each different in shape and size, well appointed for comfort, convenience and style. The outdoor garden restaurant and bar are set in a large mansion, a relic of the Portuguese colonial era, with long verandahs extended patios and multiple sit-outs. The restaurant offers select international menu to pamper the discrete palate with due emphasis on hygiene and taste. Stylishly designed, the bar promises to keep one in good spirits. All the cottages are of different size and shape, and each has its own unique features. Externally the place is appealing, with thick laterite stonework and pillars and dome like vaults. 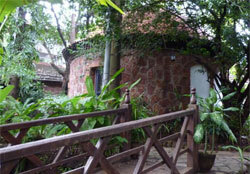 The roof is a fully continuous one of wooden rafters and terracotta tiles, curving and swooping to interconnect the various cottages.